We had crossed the upper end of the lake and moved slowly through the brush, working our way down the edge of the lake. Several deer had been spotted but all were moving away from us. The grass was nearly waist-deep in places and the sloping hillsides were covered with cedar trees from two feet to maybe twelve feet high. As we worked our way up the slope in front of us there was no movement to be seen, but as I approached a small cedar tree in front of me a doe exploded out of the grass beneath the tree. I was maybe thirty feet from her as she bolted out, straight away from me. The little rifle was at my shoulder and my eye caught the large white bead automatically. In less time than it takes to tell I put the bead on the rapidly moving doe and pulled the trigger. At the shot I saw her tail go up in the air and she disappeared from view in tall grass. I found I had levered another round in the chamber without noticing and I stood still for moment to see if the deer would try to get up. After a short time I eased my way forward and there, maybe fifty feet from where she bolted lay the doe. The shot had taken her through the neck from back to front, instantly dropping her. Now the work began. 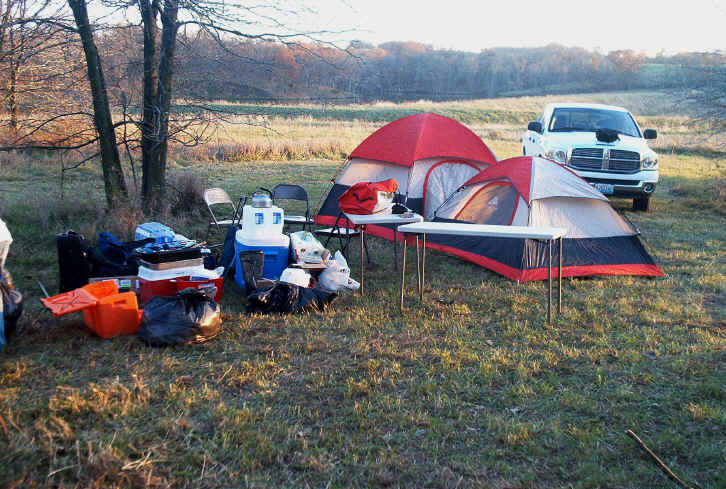 This was the second day of a three-day hunt on a friend’s farm in northern Missouri. He has been developing his land not only to raise crops, but also with the idea of creating habitat for deer, turkey and quail. 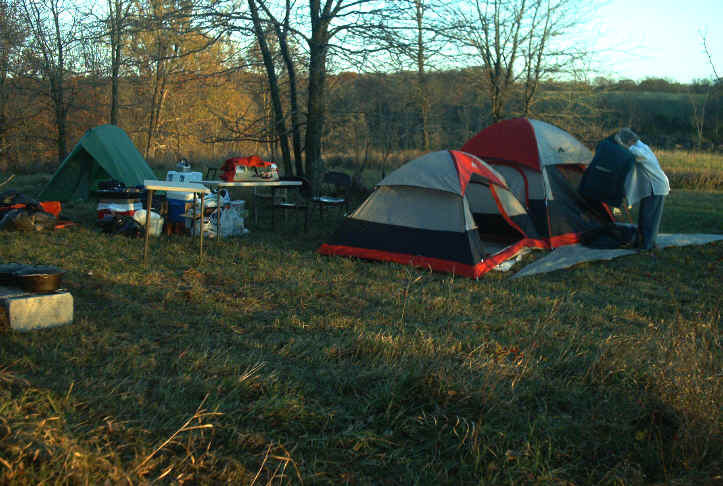 The Missouri Department of Conservation had been helping and suggested that he crop the does on his extensive acreage, as the doe to buck ratio was quite high. I was invited to go up during the firearms portion of Whitetail season and help take some does. Since we love the meat and hunt more for meat than for trophies I was certainly happy to be included. One of the rifles I took along was my Winchester Model 94 Trapper in .30 WCF (or .30-30 as it is known by most). This little gun is one very handy firearm. I use it a lot around my place and love it’s fast handling in tight quarters. I had modified it slightly so that it was more to my tastes. I added a white bead front sight and installed a Williams 5D rear sight. For my use I removed the aperture so that the rear sight is basically a “ghost ring”. This makes snap shooting fairly easy, at least with practice, and is accurate enough to make consistent hits at hunting distances. At least at the distances I am comfortable shooting. I am not impressed by the latest fad of shooting animals at super-long ranges. I know people can do it. I also know that game can be wounded and lost when that is done. I personally prefer to hunt. By that I mean that I like to try to get up fairly close. I know that in some places 100 yards is considered a close shot. In most of the country I hunt these days that is a long shot. The little iron-sighted Trapper is just perfect for that kind of situation. For several months before deer season I spent time every week shooting the Trapper at distances from 50 feet out to 110 yards. I did not shoot from the bench other then when first adjusting the sights. All shots were taken either standing, sitting or kneeling. And I did not shoot at bullseye targets other than when initially sighting in the gun. For the “field position” shooting I shot either at a steel plate or brown cardboard rectangles. The cardboard pieces are approximately the size of the “kill area” on an average deer. With no defined aiming point on them, my idea was to shoot from various distances and keep all the shots as near the center as possible. I found this to be very helpful to me. The load that I have worked up for use in the Trapper is not a traditional one in that I have gone to a lighter bullet. After some experimenting I found the Speer 130 JFP to give good accuracy and good performance on game. I like this weight bullet in the little gun as it shoots flat to the distances I am using it and it does not produce unpleasant recoil. I am not “hot-rodding” the Trapper. All loads are by the book. 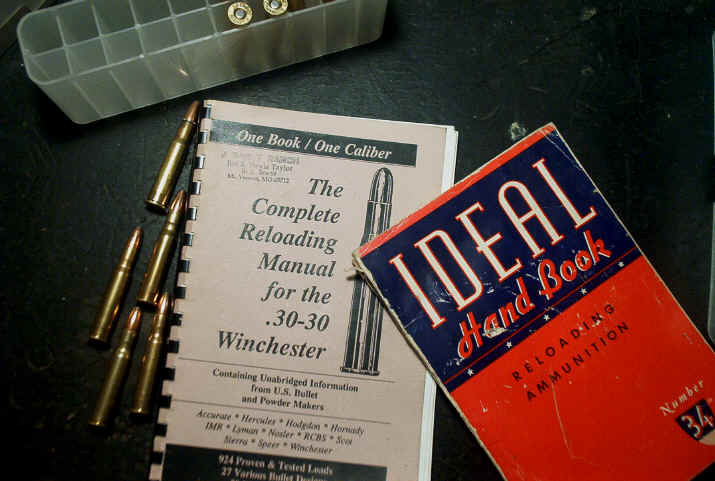 I have a number of reloading manuals and stick with them. I settled on 3031 powder, though truth be told, a number of other powders work equally well. If you decide to try the Speer bullet in your .30-30 you might want to see if it prefers a certain powder. 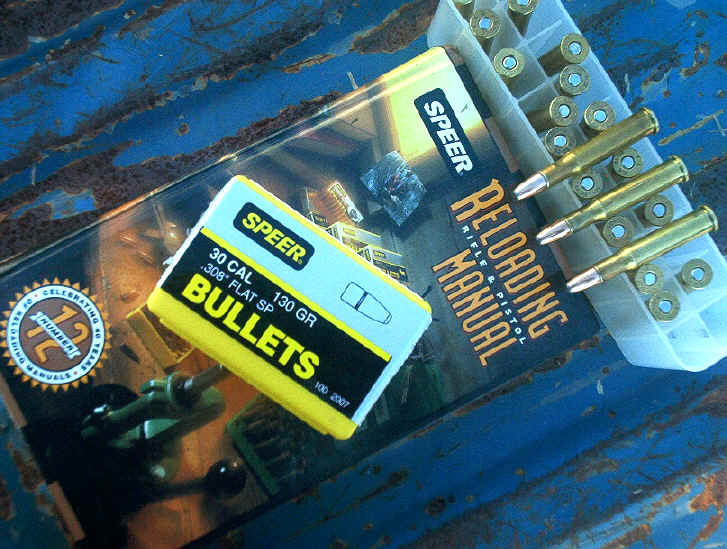 Reloading the .30-30 cartridge is fairly straightforward. The case walls are thin enough to not present the problems that higher-pressure cartridges do at times. Consequently one can easily reload the old rimmed cartridge on smaller presses and even hand-held ones if need be. It is also cartridge that lends itself quite nicely to cast bullets. Loading data is not vastly different for cast bullets. Seating cast bullets into the neck of the cartridge is not a chore as it is with the higher-pressure cartridges. 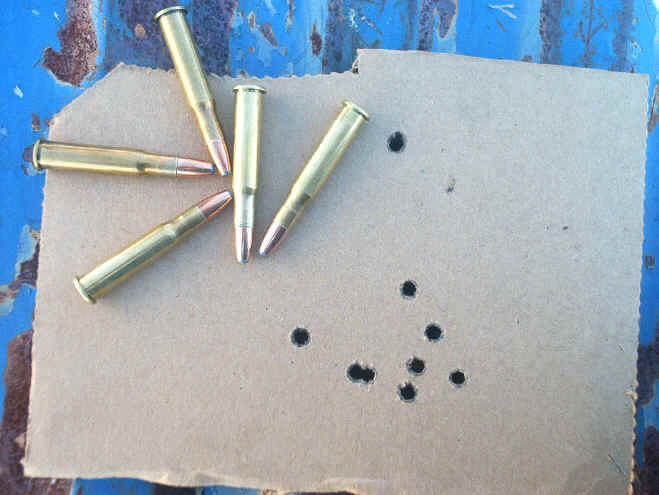 When loading cast bullets all one has to do is switch to a die that “bell mouths” the cartridge cases. 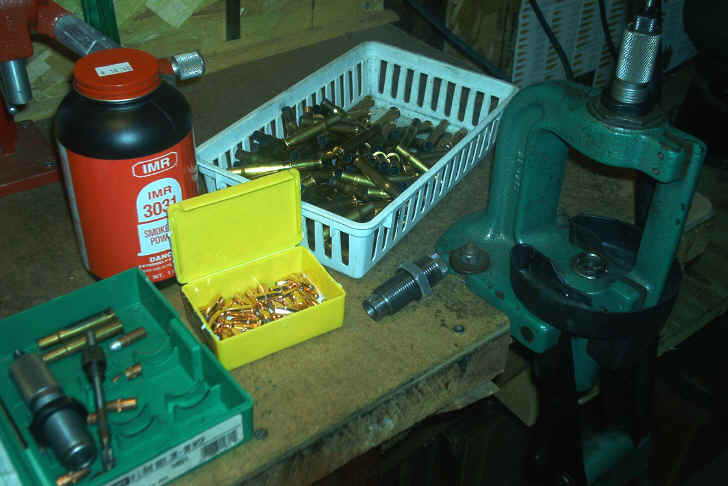 I use a Lee Factory Crimp Die for all my levergun cartridges including the .30-30, if for no other reason than to keep the bullets from being shoved back into the cartridge case when they are in the magazine. The Lee die allows for a heavy crimp without buckling the shoulder of the cartridge as can be done using the normal crimp die. The Speer bullet has worked well for me from my gun. Last year I shot a rather large-bodied deer at about 100 yards with this same combination. The bullet put a thumb-sized hole through the animal’s heart and it was down within mere feet. On the neck shot of this year’s deer the bullet held together through the bones and did not come apart. For deer-sized creatures and smaller I am convinced of its performance. While the cartridge and firearm may be passé in this era of short-fat-magnums, it will still get the job done quite nicely. And it does it without a lot of fire and noise. I was quite pleased that I spent time learning to handle the Trapper as the shot that presented itself was one that, had I taken time to think about it, the opportunity would have been gone. Because I was familiar with the gun, handling it quickly in a situation that required reaction seemed fairly easy … if one was not aware of the work involved before the shot was presented. I am happy with this firearm!